Nothing signifies the Supreme sacrifice, the million martyrdom, and the insufferable yoke of colonial rule more than the memory of the Jallianwala Bagh massacre of 1919: The merciless murder of nearly a thousand peaceful protesters without warning, till the ammunition ran out. The wounded were left to die without even a drop of water or the solace of a comforting hand. This was, undoubtedly, the pivotal event that turned loyal subjects of the empire into revolutionaries and unarmed. The poet-philosopher Rabindranath Tagore returned his knighthood, Gandhi gave up his Kaiser-e-Hind gold Medal and the people of India rejected the British rule as a brutal, racist, master-slave relationship. Nobody investigated the massacre as deeply as the tribune. While the entire Anglo-Indian press was applauding General Dyer for having perpetrated this mass murder, it was only the tribune that questioned the British government. Martyrdom to freedom stands testimony to the tribune commitment to fearlessly observing, and acting as a chronicler of, colonial atrocities. 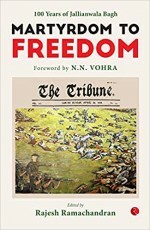 In the Centenary Year of this epochal tragedy, this book brings together essays of some of the best known authors, thinkers and historians of modern India, alongside priceless articles from the archives of the newspaper, dating back to 1919. With profound insights and personal testaments, martyrdom to freedom is a valuable addition to recorded history.